I've been thinking about adding to my two little tattoos for a while. I want another on my ribs and another on my back (down the centre of my spine I think). If you're looking to get a tattoo, a lot of research goes into the design and the meaning behind it unless you really know what you want beforehand. I've been looking for simple designs and places to put them that wouldn't show and wouldn't need covering up. Some people look for elaborate designs, sleeves, UV or white ink. Some are after simple designs for themselves, rather than to make a statement. 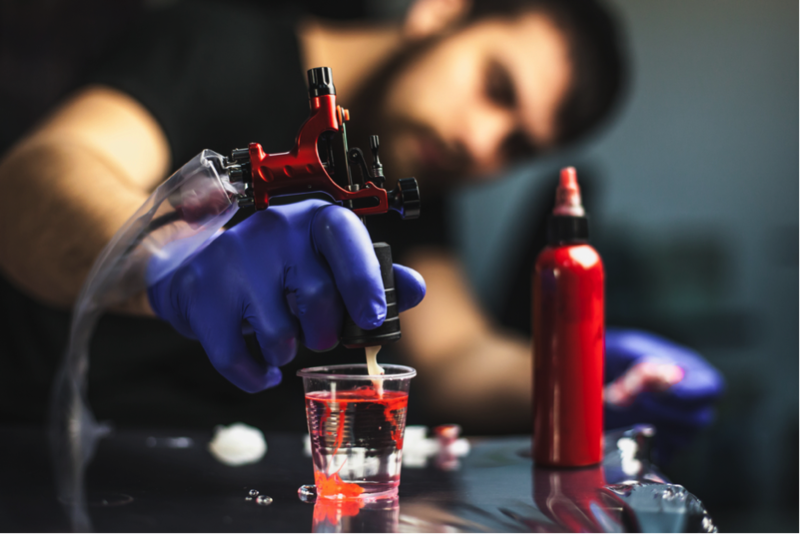 But once you've picked your design and found a reputable tattoo artist, what do you need to know before you turn up to get that special design inked on you for life? What do the artists themselves want you to know? Do we expect too much of them? Working in the tattoo industry is one of the coolest jobs going. Everyday there’s a chance to be creative with tattoo ink*, work on innovate designs and meet some pretty cool people day in, day out. Here are ten things all tattoo artists wish you knew that would make their lives just that little bit easier. 1. A tattoo will not instantly transform you into a celebrity lookalike. Showing your hairdresser a picture of Beyonce won’t mean you’ll leave the salon a doppleganger for Queen Bey and the same rule applies for tattoos. Getting a pin up girl across your arm won’t suddenly leave you with Amy Winehouse’s look and that full sleeve won’t suddenly transform you into David Beckham and have the women falling for you. There’s only so much a needle and some tattoo ink can do, so be realistic with your expectations. Have a rough idea of what design you’re after and where you want that tattoo ink before your appointment. Also, don't just get a tattoo for the sake of it! Remember, they're there for life, and we've all seen the horrendous mistakes on Tattoo Fixers! Know what you want, and make sure you'll still want it when you're 30, or 60, or 80! It’s one thing to be inspired by other people’s designs but it’s quite insulting to present a tattoo artist with an image created by another professional and ask them to clone it. At least have a look through their portfolio first. You can even ask them to put their own little twist on a design you have in mind! While it may seem very rock and roll to get tattooed under the influence, it’s actually just a waste of yours and the artists’ time to turn up wasted. Any reputable tattooist will not carry out work on anyone who appears to be inebriated (and be wary of those who will) so all being drunk ensures is that your appointment will be cancelled and you’ll wake up to a hangover rather than some fresh new tattoo ink. Hardly rock and roll after all. Alcohol also thins the blood, so may increase the chance of bruising and bleeding whilst getting tatted. If you're worried about the pain, take a pain killer 20 minutes before or find some numbing cream. See a tattoo shop in the same way you would a bookies or a nightclub; aka not a place for under 18s. Fair enough, take a mate for a bit of support but you don’t need to have the room acting as some kind of school reunion. Do you really want the person responsible for permanently marking your body distracted by chatter from your mates in the background? Didn’t think so. Spoiler alert: Tattoos don’t tickle. While some people can actually enjoy the sensation of the needle, others will find the procedure quite painful. The pain is different for each client and depends where your tattoo ink is being applied. Your tattoo artist is not going to be able to predict how you will take it so do not bore them repeatedly asking them how much it will hurt. It will. Maybe a little, maybe a lot - there’s only one way to find out. A small little tattoo on my ribs felt like little scratches and the day after felt like I'd been hit by a car, whereas the tattoo behind my ear - I didn't even feel it.. at all! You may have woke up one morning and decided you’re bored of your blank canvas of a body and want to transform into an inked god, but be realistic. These things take time and an intricate sleeve can sometimes take upwards of 25 hours of work to be completed so be aware this will not be an overnight transformation. You may also not be able to do it in one sitting. Shading especially hurts the most and takes the most time, so it may take a couple visits across a couple days/weeks to get your full design complete. My two small tattoos took 30 minutes in total as they're about the size of a 20p and a 50p coin. They also took about 2 weeks to completely heal. Yes, maybe £100 for a little star on your wrist is excessive, you can be vocal about that if you wish, but normally the prices reflect the design work, level of expertise, time and material it takes to create a masterpiece. You’re paying for a piece of art that will live on your body for a lifetime so is this really something you want done by someone who is happy to do it for a pack of cigars and a pint? Your tattoo artist will have spent time and effort creating your design, training and then spending possibly hours carefully inking it onto your body - their fee is worth it. When an artists adorns you with their tattoo ink, you essentially become an advert for their work. If someone likes your tattoo they will ask where you had it done perhaps, and voila - your tattoo artist is receiving fantastic word of mouth marketing. If you refuse to follow the aftercare procedures and look after it as advised it will not exactly become the best testimonial for their skills. And whatever you do, don’t ignore all the advice given then moan to your artist when your tattoo doesn’t heal correctly. It could get infected and that would be entirely your fault for not caring for it correctly. You can get tattoo aftercare cream from just £2.99. Have you got any tattoos? What did you wish you knew before?